A Filipino American who did his university studies in the United Kingdom, Angelo has been volunteering for Democrats Abroad Philippines since September 2018. In 2014, he devoted full time to organizing his family affairs and now has the opportunity to resume the growth of his career. He also worked as a lecturer of international studies for Far Eastern University, Manila, from 2013-2014; an assistant professor of international studies for De La Salle University-Manila in 2009; and a public information, external relations and policy planning intern for the UN Department of Political and Peacebuilding Affairs, New York, from 2005-2006. His most recent position was research associate in a project funded by the US Agency for International Development with the American Chamber of Commerce of the Philippines, Makati, from 2012-2014. He has a Bachelor of Arts in diplomacy and world affairs from Occidental College, Los Angeles, and a Master of Arts in international relations and a Master of Philosophy in politics from Durham University, England. And he speaks intermediate Tagalog. Photo by Democrats Abroad (DA) Philippines (DAPh) Photographer Joan Corpuz shows (left to right) DAPh Vice-Chair and Database and Social Media Manager Angelo Goode, DAPh Treasurer Kathleen Bergeron, DAPh Chair Lisa Pagkalinawan, Speaker and Manrkē’s Asia Pacific Chief Executive Officer (CEO) Richard Medalla, and DAPh Communications Manager Morrie Kayanan. DA Philippines held a Tax for Americans Abroad Seminar on Saturday April 13, 2019 from 3:30-5pm at the Elks Club, 7th Floor Corinthian Plaza Building, Paseo de Roxas corner Legaspi Street, Legaspi Village, Makati City, with some 22 attendees. Speaker Richard Medalla, Manrkē’s Asia Pacific CEO, explained who is required to file US income taxes, Foreign Bank Account Report (FBAR), and Foreign Account Tax Compliance Act (FATCA) reports. He also presented common challenges facing Americans abroad in complying with US tax reporting requirements, and answered questions from the audience. DA tax advocacy work, here. Our next activity is Memorial Day organized by the American Association of the Philippines on Sunday May 26, 2019 at the Manila American Cemetery. Members please check your email, including Spam, Updates and Promotions folders for the official email blast with the announcement containing further information. We are contributing a wreath and would very much appreciate donations. Kindly email DAPh Communications Manager Morrie at morriejane@yahoo.com if you would like to make a donation. Please donate--thank you! We are also organizing a Candidate Education Potluck, which is a social event. And if there is sufficient interest, a speaker event on the three historic Balangiga Bells, which were returned to the Philippines last year after being taken over a century ago. More to follow. If you are not yet a member of Democrats Abroad, you can become one by signing up at www.democratsabroad.org. Visit Democrats Abroad Philippines webpage, like us on Facebook, and follow us on Twitter. Photo by Democrats Abroad (DA) Philippines (DAPh) Admin Brian Borlongan shows (left to right) DAPh members Angela Reyes, Mary Ellen de Jesus, Yasmin Tiwana, Communications Manager Morrie Kayanan, DAPh former Vice-Chair Gene Boggs, DAPh former Secretary Omar Tiwana, DAPh former Treasurer Gay Zialcita, and DAPh Vice-Chair and Database and Social Media Manager Angelo Goode at the Elks Club in Makati City. 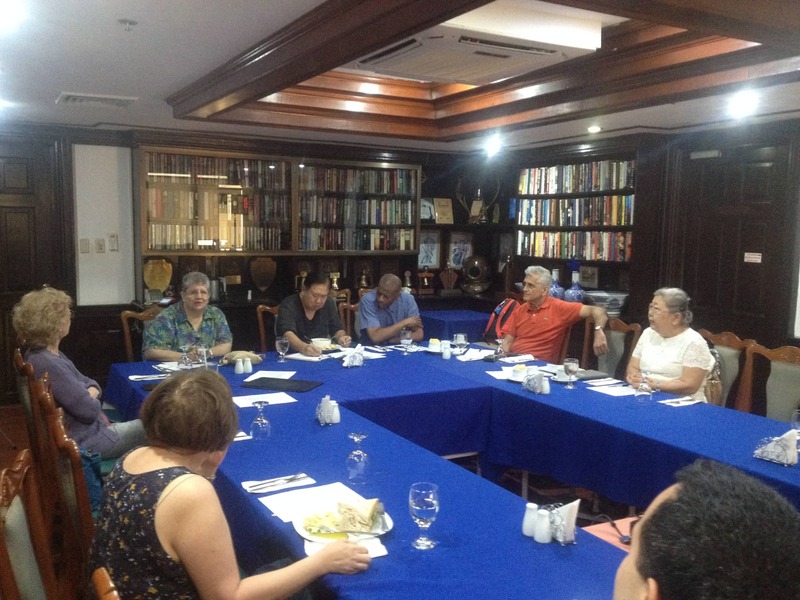 DA Philippines held its 2nd Quarter General Meeting on Saturday April 6, 2019 from 3:30-5:30pm at the Library of the Elks Club, 7th Floor Corinthian Plaza Building, Paseo de Roxas corner Legaspi Street, Legaspi Village, Makati City. We discussed International Chair Julia Bryan's report on 2018 wins; how to drive engagement, share expertise and prepare for 2020 through greater levels of participation; and having a candidate education event. A Membership Management Committee was formed. Tax for Americans Abroad Seminar on Saturday April 13, 2019 from 3:30-5pm at the Elks Club Manila Room. Here's the flier. Memorial Day on Monday May 27, 2019 at the Manila American Cemetery, organized by the American Association of the Philippines. We intend to contribute a wreath. Minutes from the April 6, 2019 meeting. If you are not yet a member of Democrats Abroad, you can become one by signing up at DemocratsAbroad.org. Visit Democrats Abroad Philippines webpage, like us on Facebook, and follow us on Twitter. Photo by Democrats Abroad (DA) Philippines (DAPh) Events Committee Bing Gelman shows (left to right) DAPh Secretary and Events Committee Chair Jeremy Slagle, DA Lion City (Singapore) former Vice-Chair and DAPh former Treasurer Bill Gelman, DAPh Communications Manager Morrie Kayanan, DAPh former Chair John Boyd, DAPh members Tricia Jimenez, Angela Reyes, DAPh Chair Lisa Pagkalinawan, and DAPh Vice-Chair and Database and Social Media Manager Angelo Goode at Launch Lab Test Kitchen in Makati City. DA Philippines held a Progressive Drinking Party to clean up the database on Saturday February 2, 2019 from 2-4pm at Launch Lab Test Kitchen, Unit 201, 2nd Floor, Renaissance Building, 215 Salcedo Street, Legaspi Village, Makati City. Thanks DAPh Events Committee Bing for the recommendation to have a Progressive Drinking Party, which is a concept borrowed from DA Lion City (Singapore) Chair Patricia Reed who is happy for other DA Country Committees to also hold their own Progressive Drinking Parties. Thanks also to the volunteers for all your hard work and dedication--calling, emailing and texting some 329 DAPh members to verify they are still living in the Philippines by collecting their current landline and cell phone numbers. And thanks DAPh Secretary and Events Committee Chair Jeremy for providing the space for us with light snacks. Once all the corrections are inputted, we should organize another database clean-up event. And the Events Committee will be meeting, to be announced, to discuss events planning. If you are not yet a member of Democrats Abroad, you can become one by signing up at DemocratsAbroad.org. Visit Democrats Abroad Philippines website, like us on Facebook, and follow us on Twitter. Photo by Democrats Abroad (DA) Philippines (DAPh) member Joan Corpuz shows (left to right) DAPh members Dean Shuey, Donald Kwok, Vicki Indiati, John Sachs, DAPh Communications Manager Morrie Kayanan, DAPh member Omar Tiwana's sister Yasmin Tiwana, DAPh members Dave Kuchenbecker, Angela Reyes, DAPh former Vice-Chair Gene Boggs, DAPh member Tricia Jimenez, DAPh former Chair John Boyd, DA Lion City (Singapore) former Vice-Chair and DAPh former Treasurer Bill Gelman, DAPh Events Committee Bing Gelman, DAPh Secretary and Events Committee Chair Jeremy Slagle, and DAPh Vice-Chair and Database and Social Media Manager Angelo Goode at the Elks Club in Makati City. DA Philippines held its Annual General Meeting on Saturday January 19, 2019 from 4-6pm at the Elks Club, 7th Floor Corinthian Plaza, Paseo de Roxas corner Legaspi Street, Makati City. 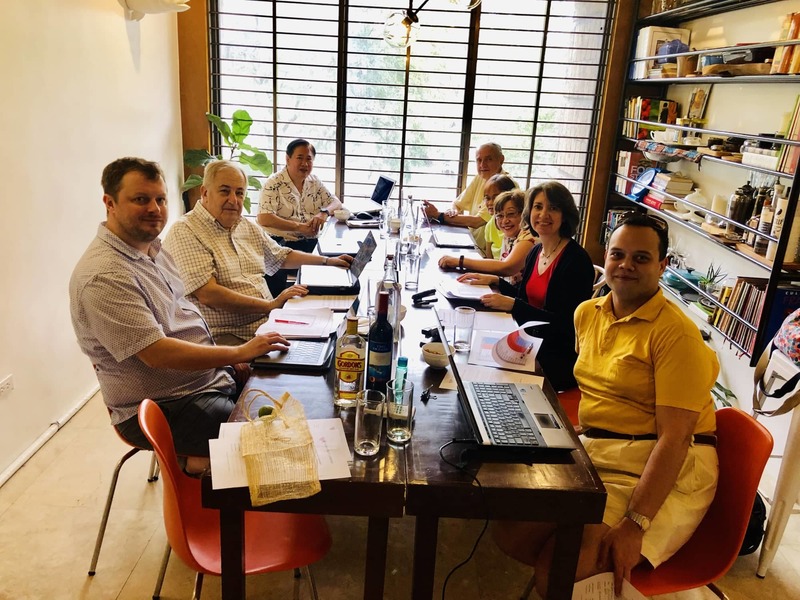 We reported on activities held in 2018, elected officers for 2019-2021, and discussed activities for 2019. Minutes from the January 19, 2019 meeting. 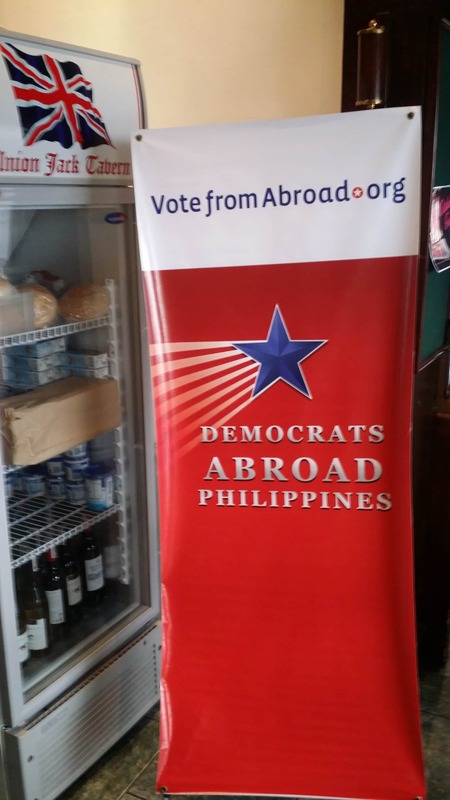 Democrats Abroad (DA) Philippines (DAPh) held a Voters’ Open House on Saturday October 6, 2018 from 2-5pm in Ortigas at Profiles Asia Pacific, Inc., One Magnificent Mile-CITRA Building, 39 San Miguel Avenue, Ortigas Center, Pasig City. Thanks DAPh member Jocelyn Pick for providing the space for us! We helped people with registering to vote, requesting ballots, and answered questions about voting in the November 2018 election. For those who already had ballots, we provided a “voting booth” where voters could privately fill out their ballots. And we provided information about whether or not voters needed to mail their ballots or if they can email or fax it back, and answered other questions they had. Due to new state laws regarding absentee ballots, we could only provide verbal assistance and couldn't assist with putting ballots in envelopes or mailing them. Voters could either drop their ballots off at the US Embassy or mail it through the Philippine Post Office with registered mail safest. Go to www.VoteFromAbroad.org and click the Request Ballot tab, which brings you to the Register to Vote/Absentee Ballot Request page. Note: when filling in your Voter Information, for US citizens living outside the country who intend to return, choosing the first option “I am a U.S. citizen living outside the country, and my return is uncertain” may be the safest answer to ensure you receive your absentee ballot if you will be abroad for some time. Follow the instructions on the website and ask for your blank ballots to be delivered to you electronically by email if possible. The website will tell you if your state allows the return of your request electronically or if you must submit a paper copy with original signature. If you are set to receive your electronic ballot by email, keep an eye out for an email with the subject line: 2018 General Election Official Ballot. It will include instructions on how to vote and return the ballot. Note: perhaps best to print your blank electronic ballot, fill it up, hand sign it, and scan. If you received your electronic ballot by email, follow the instructions in the email on how to return it. If you must mail a paper ballot from the Philippines, we suggest using the Philippine Post Office and send it using registered mail which only costs about PhP200 (US$4). If you have any questions about registering to vote overseas from the Philippines, please contact Democrats Abroad Philippines at email da-ph@democratsabroad.org or call +63.917.892.2989. Remember, your vote counts! Be absent but accounted for! VOTE NOW! DON’ T WAIT!! 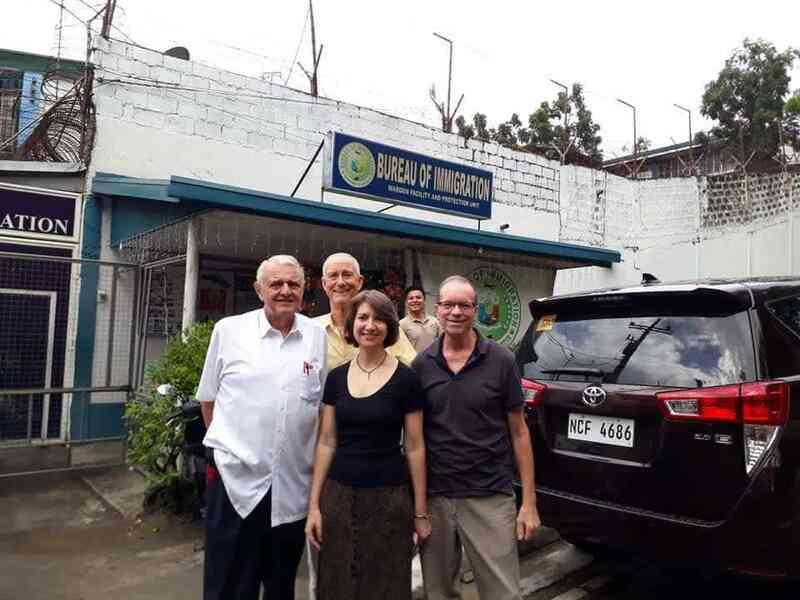 Photo shows (left to right) Democrats Abroad (DA) Philippines (DAPh) former Chair John Boyd, DAPh Chair Lisa Pagkalinawan, and DAPh members Dave Kuchenbecker and John Sachs at the Bicutan Immigration Detention Facility in Taguig City. On Thanksgiving Day, Thursday November 22, 2018, DA Philippines visited American detainees at the Bicutan Immigration Detention Facility in Taguig City and brought them food, reading materials and other necessities. We have continued to provide support for a few incarcerated Americans, with DAPh former Chair John B. and DAPh member Dave making regular visits with logistical support from DAPh Chair Lisa. DAPh member Dave has made efforts to compile a list of detainees and offer assistance. Collective-thinking foreign, economic and environmental policy; and equality and human rights for all, such as blue-collar grassroots workers, ethnic minorities, the LGBT+ community, women and immigrants among other underrepresented groups.